We analyze the coupled cycles of Middle-East geopolitical violence and oil prices. Building on earlier work that shows that low oil prices are regularly followed by geopolitical strife, and that the latter is usually followed by higher oil prices, due to actual or feared disruption in oil supply, we focus in this paper on one particular factor: Which geopolitical events are most likely to lead to sustained supply disruptions? 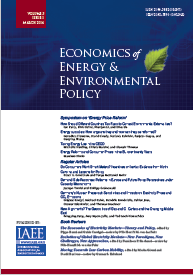 Using discrete wavelet analysis of oil production at the country level, we find that military conflicts that destroy production installations or disrupt oil transportation networks are the most significant antecedents of sustained, long term, disruptions in oil supply; whereas nonviolent regime change, internal political strife, and low level geopolitical tensions have more limited sustained impact. We discuss a framework to analyze whether conflict-related disruptions to oil supply could be endogenous to the oil cycle and offer some policy considerations for ameliorating that cycle's impacts. How Do Low Gas Prices Affect Costs and Benefits of US New Vehicle Fuel Economy Standards? This paper analyses distributional effects between participants of the EU Emissions Trading System (EU ETS) during its first trading period. To this end, a selection model is formulated and applied to a dataset based on account information and transfer data from the EU Transaction Log (EUTL). Four different ways of adding carbon prices to the dataset are explored. Findings confirm that whether a company made a gain during the first period of EU emissions trading is highly dependent on the level of free allocation it received. Consequently, large industrial companies, especially in the iron and steel and cement sectors emerge as the biggest 'winners' as they were the companies with the highest allocation surplus. This also applies to a number of electricity generators located in Central and Eastern Europe. Policy makers therefore have to be mindful about decisions regarding the level of free allocation to individual sectors and companies, as those design choices have a large influence on the way in which gains and costs are distributed under the system, which in turn has repercussions on its political acceptability. Rules for free allocation are harmonised at EU-level since the beginning of the third trading period, but relatively generous free allocation to industrial sectors and additional sources of unequal treatment remain. The analysis also confirms that small companies were less likely to participate, which points to the existence of significant transaction costs preventing many small companies from realising potential gains on the market (as well as jeopardising the efficiency of the system). It is therefore important to reduce transaction costs for small companies, in particular at the beginning of an ETS, in order to incentivise market entry.